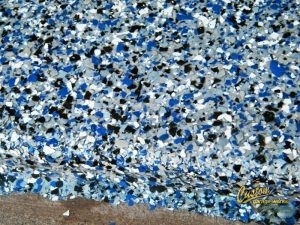 Polyaspartic Coatings For Garage Floors Are A Great Alternative To Epoxy Coatings. Are you interested in a strong, fast-curing alternative to epoxy floor coatings? If your garage floor will be subject to the sun, or significant heat, you should consider a polyaspartic polyurea coating instead! These coatings cure faster, meaning you can drive on your garage floor within 24 hours in most cases, and these coatings last longer and stand up to the test of time. Many of our clients come to us with a peeling, flaking, and failing epoxy floor disaster on their garage floors, and we aren’t surprised. Besides the fact that many of these floor coatings were done with big box store DIY kits, many are applied on acid etched floors, which doesn’t make for a great adhesion surface. If you are interested in learning more about polyaspartic coatings for garage floors in Haslet and Fort Worth, TX, give us a call at 214-494-9068 or 817-308-1305 and speak with one of our friendly associates, or read on! 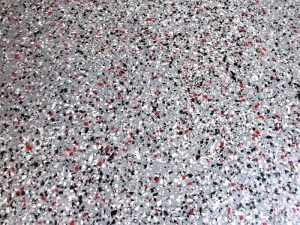 What Are Polyaspartic Coatings For Garage Floors? To begin, let’s talk about the difference between a few different coatings. Garage floor paint, which sits on top of the surface of your concrete, will dry within a few hours and will chip away over time. Paint has very little adhesion to the ground or defense against consistent use. It can sometimes be mixed with epoxy to form a slightly stronger substance. Epoxy, which is formed from one part epoxide resin and one part polyamine hardener, is a thermosetting resin we can apply as a coating. When the parts are mixed, and exothermic curing process begins over the next 72 hours, and the end product leaves you with cross-linked polymer structures that can bind to the prepared concrete surface are incredibly strong and durable. However, these coatings are not indestructible, particular when using lesser formulas, which can leave your floor vulnerable to UV rays and heat from your tires. Polyurea is a subgroup of polyurethane, and is used in a variety of industries, from roofing to vehicle manufacturing. Like epoxy, polyurea is a two part component that relies on the mixture of the resin and a catalyst to initiate the curing process. However, unlike epoxy, polyurea begins to cure within 5 seconds and can set completely in as little as 5 minutes. Obviously, this kind of reaction is too fast for typical applications, and special equipment is required. So if epoxy is taking too long to cure and standard polyurea cures too quickly to be a viable option for a garage floor, is epoxy your only option? These Coatings Combine The Strength Of Polyurea Coatings With A Slower Cure Time, Allowing For A Superior Finished Result. The answer is no, and this is where polyaspartic coatings come in. Relatively new to the industry, polyaspartic coatings are a type of aliphatic polyurea, that have a longer cure time than traditional polyurea coatings. Essentially, all polyaspartic coatings classify as polyurea, but not all polyurea coatings are polyaspartic. Polyaspartic coatings retain all of the durability and resiliency of polyurea coatings while extending the cure time enough to allow time for proper application, giving you the best of both worlds. This means that if you need a floor coating that can withstand regular exposure to sunlight, as well as regular use for car storage, all at a shorter cure time than epoxy, you will be better off with polyaspartic coatings for garage floors. At Custom Garage Works, our garage flooring systems are designed to give you the freedom to get the most out of your garage. These systems cure faster than epoxy coatings, which means you can park your car in your garage in as little as 24 hours in most cases, as opposed to the 5 day wait time you will need with an epoxy coating. Additionally, you can count on a polyaspratic coating to retain its color, sheen, and adhesion for years longer than an epoxy coating. Epoxy coatings are susceptible to fading, clouding, and a condition known as ambering in situations that expose your floors to sunlight or moisture. If you are interested in learning more about high-quality polyaspartic coatings for garage floors in Haslet and Fort Worth, TX or surrounding areas, give us a call at 214-494-9068 or 817-308-1305! We offer free estimates, and we are always happy to answer any questions you may have. If you are looking for a better garage experience and professional grade garage solutions in DFW, we have the services you need! Updated on September 19, 2018 at 6:48 pm by Custom Garage Works.